This is first part of the edited version of the paper presented as part of the International Academic Session discussing about the Literary Evidences of Sarasvati, for the Indraprastha-Festival 2016-Delhi. 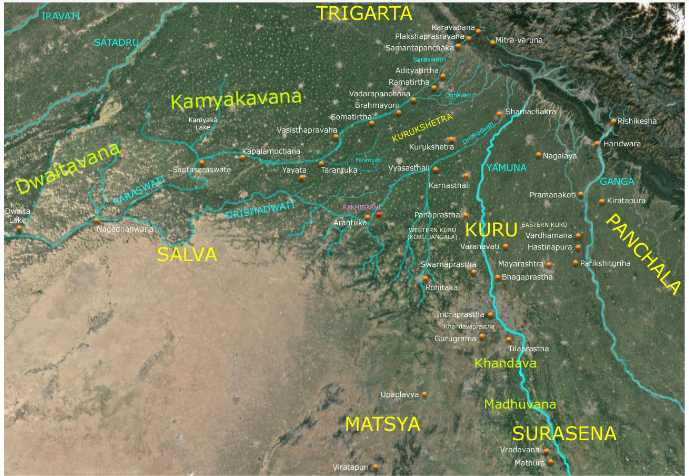 This paper focusses on the rivers, and their interconnections and linkages, especially Yamuna and Sarasvati, which flowed through the Kuru territories as described primarily in the Mahabharata, but also in the Vedas. Apart from the rivers, the paper will examine the cities, towns, villages, holy-spots (tirtha-sthans), forests and lakes mentioned in the Mahabharata as falling in this territory, also known as Kuru Rashtra with its two divisions viz. the Eastern Kuru and the Western Kuru (Kuru-jangala) separated by the Yamuna River. The paper explores the question of linkage of Yamuna with Sarasvati using literary evidence corroborated by hydrology as well as by eolian activity, tectonics, near-surface geology and geophysics and mineralogy. It then makes an in depth analysis of the Kuru territory based on the references in the Mahabharata, resulting in the most probable location of the places mentioned as belonging to the Kuru territory. Kurukshetra region, which is part of the Kuru-territory is studied in more detail due to the density of places mentioned in this region. The paper touches upon the geographical extent of the settlements so far excavated all over India and its western neighborhood and asserts that it can no longer be termed as ‘Harappan’ culture as it is a Western Indian or a pan-Indian culture. The term IVC (Indus Valley Culture) is suited to describe only a sub-region of it, which in Mahabharata is known as the Sindhu-desha ruled by king Jayadratha. The term SVC (Sarasvati Valley Culture) similarly has to be seen as a sub-region known to Mahabharata as Kuru-Rashtra. The term SSC (Sindhu-Sarasvati Culture) describes a wider region, which was the region of activity of the Aditya-Aila-Puru-Bharata-Kuru lineage of kings described in Mahabharata, with its kings like Samvarana migrating from SVC (Kuru territories) to IVC (Sindhu territories). The paper asserts that the Kuru territory is to be considered more ancient in the SSC, because of the presence of the oldest site Bhirrana (since 7570 BCE) and the largest site Rakhigarhi (since 4600 BCE) in this region. The paper then makes a detailed analysis of the pilgrimage of Balarama along the Sarasvati, which culminates at a spot on Yamuna corroborating the understanding about Sarasvati based on the latest hydrology studies. The analysis clearly indicates that the river had dried up in the middle in the arid region, which is now known as the Thar Desert. It also surprisingly shows up high density of places on the southern banks of Sarasvati in the Kuru territory corroborating well with the archaeological studies, which concludes this same region as being the most densely populated region with highest density of settlements / excavated sites. The paper then tries to answer the question about Sarasvati being a snow-fed versus rain-fed river based on literary evidences, which corroborate the hydrology studies. The paper then briefly touches upon the IE migrations from the densely populated Sarasvati-Yamuna region. Based on the studies of Avestan and Greek texts, the Daityas and Danavas, who coexisted with the Adityas in the Sarasvati-Yamuna region are identified respectively with the Avestans (described in the Avestan texts like Vendidad) and the Greek-Danaans (described in the Iliad and Odyssey). The paper then briefly analyze the Aditya-Aila-Puru-Bharata-Kuru lineage since the Sarasvati-Yamuna region is described as the territory of the Adityas (like Indra and Varuna), Manu / Yama (Yima), the matriarch plus goddess Ila – the originator of the Aila lineage, the kings in the line of Puru, Bharata and Kuru. The paper shows that the region was inhabited by a mixed ancestry consisting of the Nagas, Purus and the Yadus with Adityas, Ailas and Nagas being ancestral to both Yadus and Purus. Since all the events under study falls under the Holocene period, the paper briefly explores the chronology starting from the event of Manu’s flood and the growth of the excavated settlements from farming communities to city life and how it corroborates with the events described in the Mahabharata. As a frame of reference for this Holocene epoch, the 12,000 year long Markandeya Yuga system starting at 12,500 BCE developed by the author is used. Finally, using the accumulated literary evidence available in the Rigveda, Mahabharata and the Puranas, the paper connects the sites like Rakhigarhi (largest excavated site) and Bhiranna (oldest excavated site) belonging to the Kuru-territory with the continuous occupation of the Aditya (pre-Aila) – Aila – Puru – Bharata – Kuru kings. Ganga, Yamuna, Drishadwati and Sarasvati are the major rivers of the Kuru Territory. Mahabharata also mentions about other rivers like Oghavati and Hiranvati, which are considered as the tributaries of Sarasvati flowing through Kurukshetra. Among all these rivers, Yamuna River is the central river of the Kuru Rashtra. Yamuna divides the Kuru territories into two halves, Western Kuru with its capital Hastinapura and the Eastern Kuru with its capital Indraprastha. Places like Tilaprastha (Tilpat), Indraprastha (Indrprast), Swarnaprastha (Sonipat), Bhagaprastha (Baghpat) and Panaprastha (Panipat) are situated on either banks of Yamuna. Tilaprasta was, etymologically, the place of cultivation of Tila from which Taila (oil) is extracted. Indraprastha was the major city on the banks of Yamuna & the capital of the Pandavas. The city was probably named after the former ruler of the place viz. the Vedic Indra himself. Swarnaprastha was the marketplace of jewelers and gold workers. Bhagaprastha was the locale of the main deity Bhaga (one of the Adityas and later merged with the cult of Shiva worship using Shiva Linga) worshipped during the time of the Pandavas. Panaprastha was the marketplace of the Panis (Vanis / Vaniks), the traders. Panis are mentioned in the Vedas as a tribe of traders, much like the Yadavas in Dwaraka. Map 1: The rivers, cities, towns, villages, holy-spots (tirta-sthan), lakes and forests of the Kuru Territory (Kuru Rashtra) with the neighboring kingdoms, deserts (Maru) and mountains (Himalayas). Created based on the study of the Mahabharata and the Hydrology of the Sarasvati-Yamuna area (Haryana). Mahabharata defines Kuru territory as the land between Ganga in the east, Sarasvati in the west and the Himalayas in the north. Kamyaka and Dwaita Forests lied to its west beyond Sarasvati. Territories of Panchala lied to its east, Surasena to its south-east, Matsya to its south and Salva to its south-west. It was divided by Yamuna with Kurujangala in the west and Kuru proper in the east of Yamuna. Kurujangala contained Kurukshetra in the north and Khandava in the south. Map 2: The yellow colored spots are the places mentioned in the Balarama’s pilgrimage along the Sarasvati River. The red spots are the excavated sites. The high density of settlements in the Kuru-region is clearly evident. 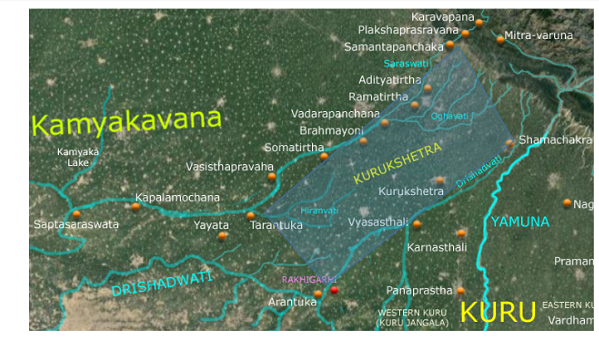 Prominent places mentioned as belonging to the Kuru territory are Indraprastha, Hastinapura, Pramanakoti, Varanavati, Parikshit-pura, Yamaprastha, Bhagaprastha, Swarnaprastha, Avishthala, Kusasthala, Vrikasthala, Makandi, Rohitaka, Panaprastha, Tilaprastha, Vyaghraprastha, Gurugrama, Vyasasthali, Pitrudaka, Ilaspada and Sapta-sarasvata. Mahabharata defines Kurukshetra as the land between Sarasvati in the north and Dhrishadwati in the south. It is precisely defined as the land between the four corners viz. Tarantuka, Arantuka, the Lakes of Rama (Samanta-panchaka) and Shamachakra (mbh.9.51). This corresponds with the four-cornered Varena mentioned in the Avestan text Vendidad (vdd.1.17). Varena is mentioned as the fourteenth of the good territory, which Ahura Mazda (Asura-Medha) created. Varena is also mentioned in Avestan Yasht as being inhabited by the Daevas (mentioned twice) and as being four cornered (mentioned 4 times). It was a sacred plain of the Kuru Territory used by the king Kuru as a field for cultivation. It was highly populated with holy-spots along the southern banks of Sarasvati. It witnessed many ancient battles. Some of these include the Devasura battles (Vedic versus Avestan conflicts, resulting in the migration of the Avestans to the west of Sarasvati and finally to the west of Sindhu), the Battle of Devas & others vs. Varuna, the Battle of Karthikeya vs Daitya Taraka, the Battle of Bhargava Rama vs. Bhishma, the Battle of Chitrangada Santanu-putra and Chitrangada Gandharva and finally the Kurukshetra War. Map 3: Kurukshetra the four-cornered strip of plain that lies between Sarasvati in the north and Drishadwati in the south and defined by Tarantuka, Arantuka, Shamachakra and the Lakes of Rama (Samanta-panchaka). The excavated civilizational area spreads over 2.5 million square km from Sutkagan-dor in the Makran coast of Baluchistan to Alamgirh-pur in the east in Uttar Pradesh and from Burzahonm in Kashmir to Daimabad in Maharashtra. The time period of Harappan culture is found to be starting from around 8000 BCE to 1300 BCE (Early & Matured Harappan). Taking Painted Gray Ware (PGW) as a continuity, it continued from 1300 BCE to 300 BCE (Painted Gray Ware, Northern Black Polished Ware – Iron Age, Indo-Gangetic traditions). A new Harappan like site is found in Tamil Nadu (Keeladi along Vaigai River, Sivaganga district). Its alliance with Harappan or SSC is still awaited. Highest concentration of excavated sites is found in the Kuru region. Largest site Rakhigarhi is found in this region (4600 BCE to 2000 BCE with Over 350 hectors in size). One of the oldest site Bhiranna is also found in this region (7570 BCE to 6200 BCE). Hence based on the current understanding of archaeology, the Kuru-region is to be considered as the source of origin of this culture or at least one of the major sources of origin, which spread to all of the western India. In the next part, I will take up Balarama’s travel along Sarasvati leading to the Source of Yamuna. 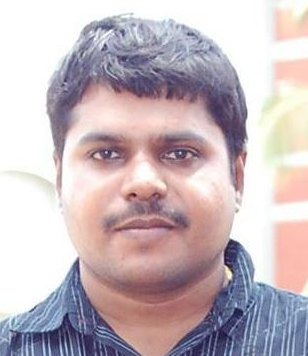 Jijith Nadumuri Ravi is the founder of the Website AncientVoice which contains 23500 pages on Mahabharata,Ramayana, the four Vedas and Vishnu Purana. It contains ancient India maps, analysis articles, lineage maps, the full text of English translation of these texts in Wikified form with 7000 plus nouns analysed creating huge information networks of Indic texts. The author additionally hosts websites like Naalanda, Takshasila and RecentVoice, focusing on Greek, Avestan and Tamil literature. He was a former ISRO scientist (2001-2006) and an artist who loves to paint events from Mahabharata. Perspectives from the Ramayana-I: Is Ganga a mere river?